We use Extra Thick PVC materials on all of our Perma-Buk Pro windows, and then fusion weld the frame and sash corners to assure years of trouble free performance. Our fully welded frames and sash assure that the weather will stay out and the corners will not "open up" over time as with mechanical fastened corners. Our windows are designed with 3/4" insulated glass, a sloped sill and fin-seal weatherstripping to provide an energy efficient combination. 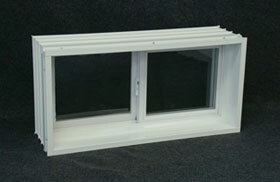 To make installation easier, our windows are fully assembled and braced to reduce your on-site labor costs. We even apply a protective film inside and out to prevent against frame damage during construction and our new innovative design eliminates the possibility of installation being upside down or backwards. All of our Perma-Buk Pro sliders feature dual sash operation with two rollers on each sash for easy operation and maximum ventilation control. The sash features a cam style lock for a positive seal and maximum security. All units feature an aluminum-framed, fiberglass mesh half screen. NVPP3216W 32" x 16" 31-7/8" x 15-7/8"
NVPP3220W 32" x 20" 31-7/8" x 19-7/8"
NVPP3224W 32" x 24" 31-7/8" x 23-7/8"